Throughout his career in professional basketball, Danny Ainge has worn many hats. The North Eugene High grad played 14 seasons as a shooting guard in the NBA — including two seasons with the Trail Blazers — and won a pair of championships as a member of the Boston Celtics. After his retirement as a player in 1995, Ainge was head coach of the Phoenix Suns for 3 1/2 seasons and also served as a game analyst for TNT before becoming general manager of the Celtics in 2003. Now in his 16th season and wearing the title as Boston's president of basketball operations, Ainge is second in seniority in the NBA, behind only San Antonio's R.C. Buford, who has been on the job one year longer. 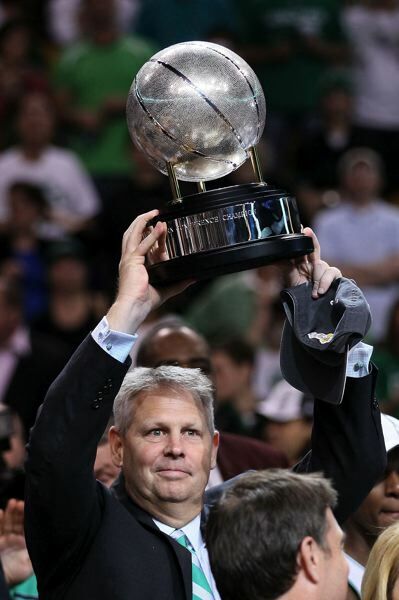 In his first 15 seasons, the Celtics made the playoffs 12 times, claiming the NBA title in 2008 as Ainge was named the league's Executive of the Year. The Celtics made the Eastern Conference finals in each of the last two seasons, losing to LeBron James and the Cleveland Cavaliers both times. This season, Boston is 6-4 after falling 115-107 at Denver on Monday in the second leg of a five-game trip that ends Sunday in Portland. Ainge, who turns 60 in March, spoke with the Portland Tribune via phone as he drove from his home in Wellesley, Massachusetts, to Portland, Maine, to watch the Maine Red Claws take on the Westchester Knicks in a G-League contest. Tribune: Does it feel like you've been at your job 16 years? That's an eternity in the NBA. Ainge: It does. It seems like a long time. Tribune: Aside from your first season, when you fired Jim O'Brien midway through and had John Carroll finish the season, you have had only two coaches over that span — Doc Rivers (2004-13) and Brad Stevens (2013-18). That's pretty good stability. Ainge: That has been a great part of the job. Being able to work with those two guys has brought me a lot of joy. We have had two really smart, hard-working, capable coaches who are great leaders and good people, too. Tribune: You have made 54 trades throughout your career in Boston. Is that a fun part of your job? Ainge: There is some fun in making deals, but sometimes they're the hardest thing to do. I become attached to my guys. It is a very hard thing to do in most situations, but in most of the cases, it's necessary, and in a lot of the cases, it turns out better for the players. Tribune: The biggest one was the 2013 deal that sent Kevin Garnett and Paul Pierce to Brooklyn for a package that included four first-round picks. You got Jason Tatum and Jaylen Brown out of that, and one pick was included in the trade that brought you Kyrie Irving. Ainge: I had mixed feelings at the time. I was envious of Brooklyn getting 'KG' and Paul. The Nets had a lot of other good players all in the prime of their careers. I knew KG, Paul and Jason Terry could help that Brooklyn team. We were in more of a rebuilding state, but I would have been more than happy to let (Garnett and Pierce) finish out their time and retire as Celtics. But when that opportunity came along, we were ready to make a deal. It was a deal that we had to do for the good of our franchise. Tribune: What about the draft — do you like that? Ainge: I do enjoy the draft. It's an interesting process, which sometimes includes trading during the draft time. But just the whole draft process — trying to improve your team through trades and using your picks to gain players you can develop — all of that is fun. Tribune: Your best draft might have been in 2004, when you got Al Jefferson, Delonte West and Tony Allen all between the 15th and 25th picks. Ainge: Al turned out to be a terrific player a lot faster than I thought he would, and Delonte and Tony were studs. They played with such intensity and passion. I watched them play against each other (West for St. Joseph's, Allen for Oklahoma State) in the NCAA Tournament's Elite Eight, and was hoping they would not do well in the Chicago predraft combine. They actually did not do all that well. We had them rated much higher, and they slipped to us. We were thrilled. Tribune: How do you feel the season has gone for the Celtics so far? Ainge: We have had our moments. We have had some amazing quarters and some pretty poor quarters. We have good depth, but Brad is still getting to know the team and trying to figure out the best combinations. I feel good about our team, about the guys' attitude and willingness to do what it takes to win. Our play has been inconsistent so far, but I'm not worried about it. We're a ways away from being a finished product, but I think we'll get there. Tribune: You changed little with your roster in the offseason, instead benefitting from the return to good health of Irving and Gordon Hayward, both injured much of last season. Ainge: That's true. The rest of the players are so young and played so well in the playoffs last year, we wanted to let them grow together. Implementing two players doesn't seem that complicated, but implementing arguably your two best players is a bit more challenging. Tribune: The Celtics lead the league in defensive rating by a good margin. Ainge: Yeah, but I feel like we need to get better defensively. Our effort is good, but we can still get better. I probably feel a little bit better about our defense than Coach Stevens does, but that goes with the territory. Tribune: Conversely, you're right down at the bottom of the offensive numbers — 27th in offensive rating and 26th in effective opponents' field-goal percentage. Ainge: I'm not worried about any of that. It's early in the season, and it's such a small sample size. We have a lot of guys who can score, make shots and create shots. It's about finding a way to maximize what we have. Tribune: You have extremely balanced scoring — six players averaging in double figures, 10 averaging 4.6 points or more. Ainge: Our biggest strength is our depth. But it's a difficult coaching responsibility trying to figure that out and keep everybody happy, all the while maximizing each guy's talent. That's almost impossible to do when you go 10-deep. Brad has a tough job doing that this year, and the players have a tough job making the sacrifices to do whatever it takes to win. Tribune: How has Irving looked coming off knee surgery? Aingw: He started out slowly, but he is back to being himself the last handful of games. I love Kyrie's leadership. I love how he is taking responsibilty and how he is building up the games and the confidence of the younger players. He has been a joy to be around. Tribune: How has Hayward looked coming off foot surgery? Ainge: He has had some really good stretches of games. He has had some games with great rebounding and defense, and some good offensive games. When you're coming off an injury like that, you're trying to feel your way through it. You're so concerned about the health part, you lose focus on the actual game part. I'm not worried about Gordon other than health. He is too good a player, too good a decision-maker and shooter and thinker and competitor when he can get his mind to where nothing matters but winning and he doesn't have to worry about all the medical stuff. Tribune: Brown is 22 and Tatum only 20. How are the two young bucks developing? Ainge: They're playing well. You can't just look at a box score to judge performance. Their stats going to be less than they were because of less minutes, less touches, less scoring opportunities, but those guys are plain better than they were last year. I like what they've learned. I have all the confidence in the world in those guys playing against anybody at any time. I'm excited about their futures. Tribune: Were you relieved when LeBron James left Cleveland for the Western Conference and the L.A. Lakers? Ainge: I was actually a little disappointed. He has been a guy we have tried to beat for a lot of years in the East. We came really close last year. I was looking forward to the challenge again, but maybe we'll get that chance again down the road. Now it looks like Kawhi Leonard has taken his place in the East as a top player on a top team (Toronto). It's good to have players like LeBron and Kawhi and teams like the Warriors in the league. Those are the teams you like trying to beat. Tribune: How do you feel about Toronto with the coaching change and the addition of Leonard? Ainge: They were great last year, but they ran into a tough Cleveland team that was hot and played great basketball in the playoffs. We were fortunate to not have to play them. I thought they were the best team in the East through the regular season. They're equally as good this year. Tribune: All of a sudden, it seems the East has a burgeoning power in Milwaukee and its star, Giannis Antetokounmpo. Ainge: Milwaukee is a terrific team. (The Bucks) have good shooting. Giannis is one of the top players in the game with all the things he does and the difficulty of matching up with him, and Khris Middleton has become a much better player. He gave us fits in the playoffs last year. He is a great shooter and efficient offensive player. I like their team. Tribune: What will it take for you to consider this a successful season for the Celtics? Ainge: I usually don't make any standards. I let the players do that. Last year, you have to give our players credit. I didn't have the same high expectations the players had, and they reached (the East finals). I don't ever want to put ceilings on what players can do. It only matters what they think they can do. They will determine their success. I'm looking forward to watching them, and hopefully they will reach their full potential. Tribune: Your oldest son, Austin, is in his eighth season as the Celtics' director of player personnel. What kind of job is he doing for you? Ainge: He is doing a great job. There is nobody in my lifetime who has come even close to a person with whom I've talked more basketball than Austin, from the time he was a young boy. We know how each other thinks. He is passionate about the game and brilliant in what he does. Tribune: You and wife Michelle have six children. How is the rest of the family doing? Ainge: Very well. All six of my kids are married now, and we have 15 grandchildren. Tribune: Have you had the chance to watch the Trail Blazers play on TV yet this season? Ainge: I have. They're a scary team. They have the ability to score a lot of points. I like how they compete. Their guards are so very talented, such dynamic scorers, and they have good role players around those guys. Portland is a team that can beat any team on any given night.